In Hawaii, where he lived for 42 years, Paul Saviskas frequently visited Punalu’u Black Sand Beach on the Big Island not far from Volcanoes National Park. He was attracted to the place not just by its stunningly beautiful scenery, but by fellow habitués: Hawksbill and green sea turtles that gather there to feed on a plant called limu, bask in the sun and nest. Thus resolved, he bought a bunch of disposable underwater cameras and photographed Punalu’u’s turtles from various angles, capturing detailed shots of their heads and flippers, and their shells, carpeted in algae so fine it looks like felt. Finally, Saviskas wanted to get a picture of a turtle’s underside. He positioned himself to do so and pressed his camera’s shutter release, resulting in a loud click. The subject turtle reacted by turning around and staring at the underwater paparazzo. In any event, the portfolio of images was complete, and Saviskas set to work bringing the photograph in his head into being. Saviskas grew up far from the tropical Pacific, in Worcester, Massachusetts, where his father owned a precision parts fabrication business. At age 14, Saviskas began his apprenticeship there. His father, encouraged, thought son Paul was practicing to become a parts maker. Before long, Saviskas had created a few pieces that he thought had merit, and he approached the owner of a neighborhood barbershop with a proposition. And they did sell, for $12 or $15 each. “It was better money than I could have made throwing the (Boston) Globe, and I got my stuff in three or four other shops,” Saviskas said. He began to entertain hopes that he might sell enough pieces to afford the ’58 Corvette he dreamed about. That didn’t happen — too little time, too few barbers — but Saviskas the sculptor had begun, irretrievably, to take shape, and he had discovered his preferred medium: steel. For a time, Saviskas would spin wheels at Quinsigamond Community College and Worcester Junior College. He studied accounting, but he couldn’t make numbers work for him. He started down the road to becoming a state trooper until the woman that would become his wife told him that she would not marry a cop. So, Saviskas became his father’s number two man. After passing muster with the FBI, Saviskas’s dad was entrusted with making parts for MX missiles. The work was exacting, almost beyond measure. “Tolerances were extreme,” Saviskas said. “A human hair is four ten-thousandths of an inch in width. We were dealing with tenths of thousandths of an inch. “I worked for two months on a piece that I could hold in one hand,” Saviskas said. Parts made in Worcester were joined with parts made by other fabricators from around the country to make missiles at a location unknown to Saviskas. “Quality had to be No. 1, and my father was a stickler for that,” Saviskas said. As a sculptor, Saviskas is given to like precision and discipline. 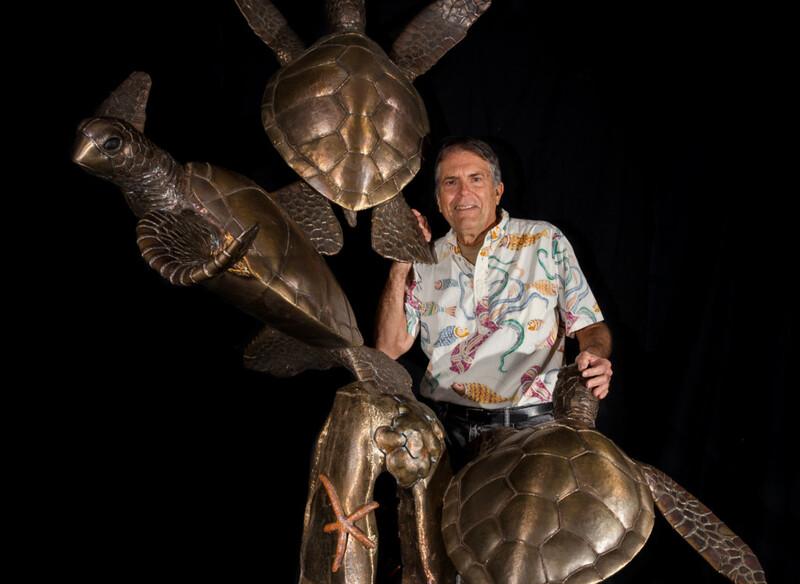 He devoted two years to his three-turtles piece, which is now on exhibit at the Center for the Arts in downtown Panama City. The sculpture, by Saviskas’s estimate, comprises $30,000 in materials. Saviskas traded Honolulu for Lynn Haven two years ago to be near family, including his 92-year-old mother, a sister and a nephew who was a fighter pilot at Tyndall Air Force Base before he was displaced by Hurricane Michael. Hawaii seemed like the next best thing, but there was no call in paradise for an industrial parts maker, so Saviskas put his art to work. He found a niche making elaborate gates for the rich and famous. Customers included Kelsey Grammer and Carlos Santana. He enjoyed referrals from designers and architects to the point where he was pinning deposit checks on the wall and telling people, imprecisely, that “I will get to you when I can.” Once, he crafted a spiral staircase for an existing building so exactly that when it was dropped into its permanent home through a window, it fit perfectly and astounded passersby who observed the installation in progress. The dragonfly and the “humuhumu” soon became the two most photographed pieces of public art in Hawaii. Saviskas is aided in all that he makes by his devotion to tai chi and qi gong, disciplines that account for his impeccable posture and transport him to a place of calm where creativity flourishes. Not all artists, it seems, are temperamental. Provides educational experiences, performances and exhibits that contribute to cultural enrichment in Bay County. Open Tuesday through Saturday, 10 a.m. to 5 p.m.